40lb - 120lb / 38" - 63"
Supplemental sizing information is given in text only on the labels (not illustrated). The belt routing path is not completely labeled. The belt routing path is not completely labeled. The seat belt type warning on the label does not explicitly state that a lap-only belt may not be used, and it is written in text only (not illustrated). The instruction manual was attached in a hard-to-find location when the car seat was removed from the packaging. The instruction manual storage location may be difficult to find. Supplemental sizing information is given in text only (not illustrated) in the manual. The warning that the safest place for children is the rear seat is not illustrated. 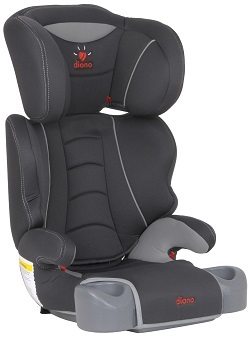 In the section detailing proper belt routing, the car seat is not depicted in a vehicle seat in the illustrations. There are no illustrations on the car seat showing how to convert the booster from highback mode to no-back mode.